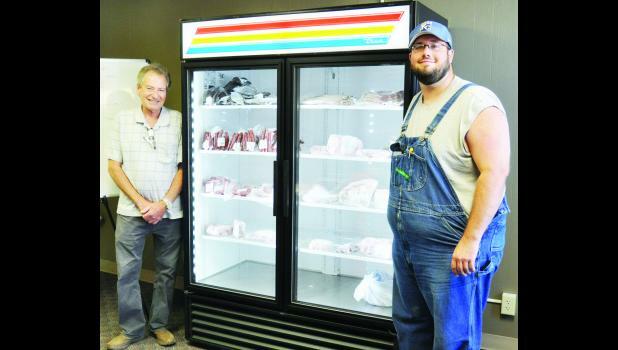 Heartland Meat Market recently opened at a location just off the south side of the Holton Square in hopes of connecting local meat producers directly to area customers. Located at 321 Pennsylvania Ave. just south of Kellerman’s Real Estate, across the street from the post office, the business is owned by Holton High School alumni David Tinney and Matt McCauley. At the first of the year, Tinney, McCauley and Chad Bontrager, all of Holton, purchased Bowser Meat Processing in Meriden. Tinney said the products that will be stocked at the Holton location will include ground pork, pork sausage, ground beef, pork chops, pork roast, pork steak, brisket, chuck roast, rump roast, stew meat and a variety of steaks. Tinney said the meat comes frozen so that no preservatives have to be added. The market also offers weekly specials. Heartland Meat Market, which opened two weeks ago, also offers jerky and jerky sticks that have been processed in Meriden. Locally sourced bacon is also available. Tinney also owns Community Assisted Living, which serves people with disabilities, and the meat locker and market help provide job opportunities for the clients. “They assist in the packaging and the local delivery of the products. So it gives them some meaningful employment,” he said. The hours of the meat market are 3 p.m. to 6 p.m. Wednesday through Friday and 9 a.m. to 1 p.m. on Saturdays. Delivery is available. For more information, call 785-364-7288. “It’s nice to kind of incorporate the locker here, as well as provide work for people with disabilities,” he said.